When we say “online marketing” to small business owners, most respond with, “I’m not that into social media, thanks.” Not quite what we meant, but good to know! While social media marketing is a part of online marketing, it certainly isn’t the entire pie. There are many different aspects of online marketing, including Google Pay Per Click, social media marketing, web design and SEO, and email marketing, just to name a few. All of them are important, but if you simply advertise on social media you’re going to be missing out on huge demographics of potential customers. Of all the different forms of online marketing, email marketing is one of the most unrecognized and one of the most powerful. Yes, we hear many objections to email marketing.. I don’t look at other companies’ marketing emails. What if one of my emails goes to the social or promotion tab? Commercial emails will irritate my customers! What if my emails don’t get delivered in the first place? (And here’s the big one) Email marketing just doesn’t work. Well, in this blog post we’ll prove to you that email marketing not only works, but also provides certain huge advantages to a small business owner like yourself over social media marketing that should certainly not be dismissed. First, like watching the TV series Star Trek, let’s take a look at the data. 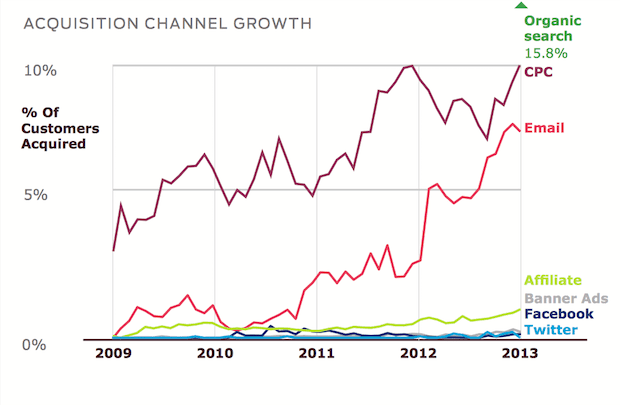 This chart by OptInMonster shows key statistics to prove that email as a platform is nothing to sneeze at. Email as a platform still has more users worldwide then Facebook and Twitter combined. Almost all of those users check their email at least once a day; for many of them it’s their first online activity of the day. According to this chart, email is still a huge, hulking mass of a communications platform that is available to almost a quarter of the people on planet earth. Email also has the highest daily check rate and the lowest never-check rate of all online marketing tools. More people are checking it more often than anything else. And it’s growing. According to recent studies, email is still continuing to increase both in number of users and worldwide email accounts every year. This will continue through 2019. 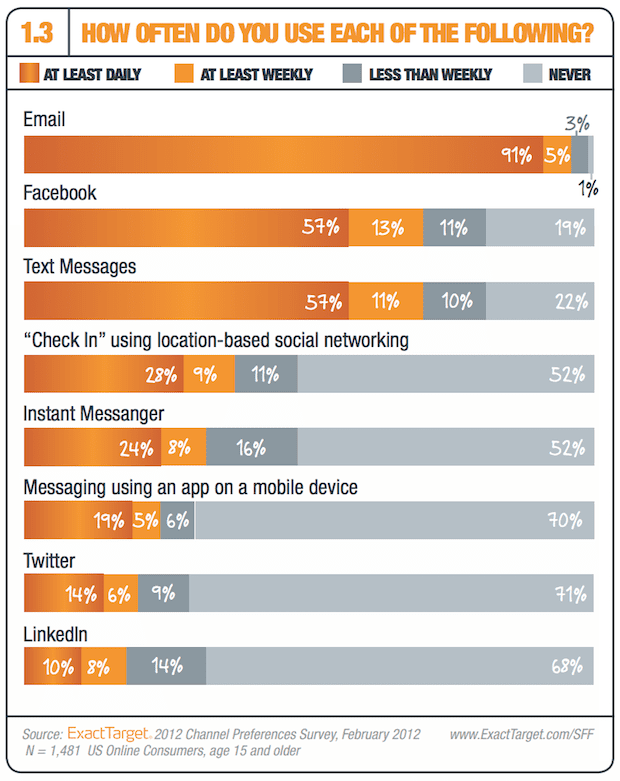 The types of individuals that check their email are also different. Unlike social media users, people who check their email are more likely to be looking for promotions or deals from companies that they do business with. According to this article, the amount of users who make a purchase as a result of emails is over three times the amount of Facebook, and 10 times the amount of Twitter. Bottom line: email marketing is an established, growing communications platform that continues to lead the planet in users from almost every demographic. And there’s no signs of that changing anytime soon. Or, in the words of the OptInMonster article from which these graphs were taken, EMAIL IS NOT DEAD!! Now we get the fun part: what are the juicy benefits of email marketing as opposed to social media? Everything on the internet points back to your email account. When you lose your password, you go back to your email. When you make a purchase, you get your receipt in your email. People are required to check their email over and over. And as we mentioned earlier, almost every demographic and age range uses email as a primary means of communication. Not only is email ubiquitous, it also plays well with others. No matter what other platforms you’re using for marketing – social media, Google PPC, SEO – email integrates flawlessly. For instance, you can take your email marketing content and use it to craft social media posts without having to start from scratch. Inside your emails, you can have links to your social media pages. You can also use email marketing to promote a social media marketing event, increasing traffic to your page or event. Email is a team player and will happily mix with whatever other marketing activities you’ve got up your sleeve. According to research conducted by Marketing Sherpa, 60% of survey respondents chose email as their preferred way to receive promotions and updates from companies they are interested in doing business with. 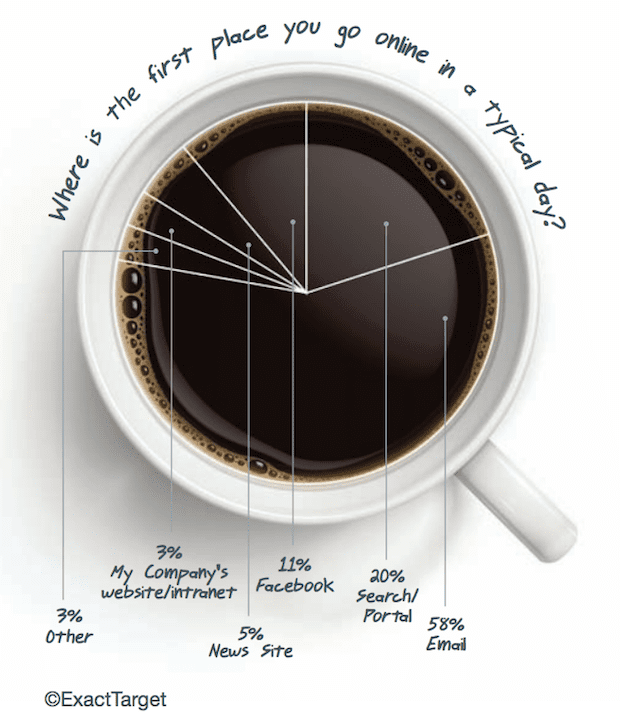 According to that same research, only 20% of respondents chose social media and 17% chose text messages. Also according to Marketing Sherpa, 91% of US adults like to receive promotional emails from companies they already do business with. Many leads and customers are more likely to read and take action from a marketing email because they’re already looking forward to having that type of communication with you. Furthermore, if someone’s on your email list, odds are they’re already interested in you as a company or one of your products. HubSpot calls these people “hand raisers”. They are people who have somehow ‘raised their hand’ to say yes I’m interested in what you have to offer. As a result, your odds of converting them to a lead or customer are much higher. A word to the wise, though: businesses that do send unsolicited email marketing messages often sacrifice company image and success for a quick buck. As a result, many of the most reputable email marketing systems recommend not purchasing an email list but generating them organically through your business relationships. Social posting is environmental. Email is direct. When you send out a message via social media, you have no idea if the people who see it are the ones who are interested in your product. You could easily get lost in the feed. When you publish something, who sees your post is not only depends on who is on your subscriber list, but also the algorithms of social media. This is not the case with email. When you send an email, it goes to every single one of your recipients every time. Delivery is not contingent on reach, algorithms or SEO. It’s one-to-one: one email, one person, every time. A 2016 study by GetResponse showed that email marketing delivers the highest overall ROI. Another survey by the Direct Marketing Association and Demand Metric of Marketers in the United States showed that email achieved a median ROI of 122%, which was more than four times higher than other marketing brands, including social media (28%), direct mail at (27%), and paid search (25%). In 2016, email marketing generated $44 of ROI for every one dollar spent, which was up from $38 in 2015. ‘Nuff said. 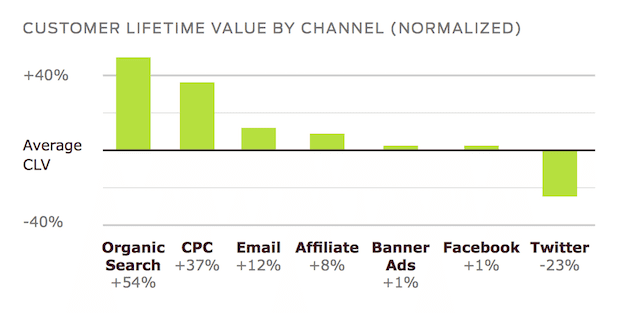 The results are in: email marketing will maximize your ROI. Taking a prospect from a lead to a customer is no easy task, but email does it better than anybody else. Mckinsey reports that the average order value of an email is at least three times higher than the average order value of a social media post. Also according to Mckinsey, email is almost 40 times more effective than Facebook and Twitter in helping your business acquire new customers. With email marketing, you’ll have higher success in attracting that potential buyer and getting them to actually buy than you would with social. Your emails reach on average 79% of the people that you send them to. On the other hand, Facebook organic reach has declined in recent years to between 1 to 6%. That means only 1 to 6% of your fans will actually see your post at any given time. Email is a much better option for sending out both sales emails and current customer communication emails like newsletters. What good is a newsletter if only 1 to 6% of your loyal customers get to see it? If your business needs a reliable way to communicate with your members and customers, you need a method you can trust. And that’s email. A study by Custora found that customers acquired by email have a 12% higher lifetime value than average. The same study showed that customers acquired through Facebook have only a 1% higher lifetime value than average. 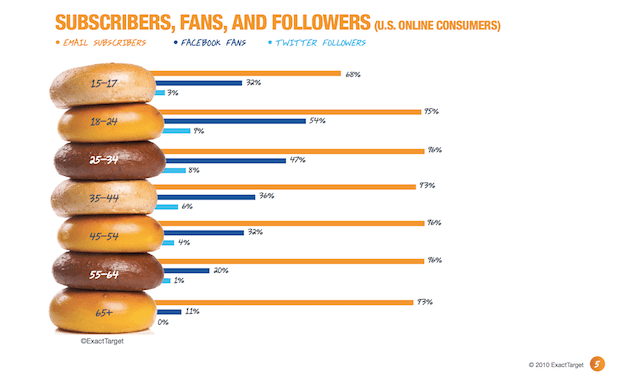 Customers acquired through Twitter tend to be worth about 23% less than average. People who you engage via email are not only more likely to buy, they’re more likely to stick around. Email marketing is effective, but it’s also quick. Once you learn the basics, you’ll be able to put together an email in no time flat. And not only that, there are plenty of email marketing software out there that give you the tools and training you need to quickly learn and design emails (as opposed to the dozens of social media platforms on the market, which all have their own complicated advertising managers that require time and effort to familiarize yourself with). If you’re going to outshine your competitors, one-on-one communication is going to be one of the biggest guns in your holster. Opening an email is a much more personal experience than coming across a random, generic social post that is addressed to an entire community. Composing personalized emails makes sure customers feel connected to you as a business, which will dramatically increase your likelihood of getting a buy. Pretty much all social media posts look the same: an image or a video accompanied by text. On the other hand, emails can be customized to match your brand image and aesthetic. Are you a high-end restaurant in Chicago? Make your emails sleek and shiny and highly professional. Are you a flower shop on the Oregon coast? Include color and dynamic images of your spring flora as well as an unlimited amount of characters in the descriptions to really bring your company to life. Email has no restrictions to design and no restrictions to the number of characters you’re allowed to use. It’s about as close to a blank canvas as you can get in the world of digital marketing. Using email marketing software, you can design entire campaigns of emails to be sent when someone opts into your email list. That means that if someone makes a purchase, you can send them one email about the purchase, another thanking them, and another about an additional item that may be helpful, all automatically. Social media platforms have no automation powers even close to this. OK, OK. Email marketing sounds great! But there are some very viable concerns I need to have addressed before I invest my time in actually doing it! Maybe you’re not one of the types of people that opens up your marketing emails. Fair enough, but that doesn’t mean that nobody is. Odds are that you’re not the kind of person who opens every letter you recieve that comes via snail mail either. But I personally have older friends and family that sit down every week and do exactly that. The data shows that many people do, in fact, open up marketing emails and do make purchases as a result. Like so many other things in your business, it’s not necessarily about how you function, but how your customer functions. And while you may not be the type to go through each of your emails individually, your customers may be. In business you have to speak the language of your customer. If you don’t like listening to your customers’ wants and needs, why are you in business anyways? Many email platforms have distinct inbox tabs that filter out promotions and social emails to unclutter inboxes. And many marketing emails do get filtered into these tabs. That being said, there are plenty of techniques in designing your email that will minimize the likelihood of this happening. Design your email in plain text and use fewer images rather than more. Don’t write a promotional email, just write an email to your customers! That way, when Gmail or Outlook scans your content, it will be less likely to recognize it as a marketing email and send it straight to the recipient’s promotions tab. What’s worse than getting demoted to the promotions or social tab? Your email not even getting delivered. Sometimes poorly designed emails may not get delivered to their intended recipients. But again, there are some best practices you can use to minimize the likelihood of this happening. Don’t clutter your email with too much content. Make it simple, sleek, and easy for someone to read. Also don’t use spam keywords in your subject heading or in the content of the email. Email software and platforms can discover these and remove emails that fall into this category. Remember, even if a few emails don’t get delivered to a couple of recipients, you’re still getting upwards of a 70% delivery rate as opposed to a 1 to 6% delivery rate if you sent the message out via social media. Sometimes emails with too much design have a problem displaying on tablets and phones. You need to be attentive to how your email appears on a variety of devices. One way you can minimize the likelihood of appearance issues is to test your email before you send it. Most email marketing platforms have this option. If you’re not using an platform, simply send it to yourself and see how it looks on your phone. Keeping your emails simple also helps here. Some people opt to receive text-only emails, so keeping your email simple increases the likelihood that these people will see it. Sometimes slower Internet connections have difficulty downloading larger images in emails. Again, keep it simple. Use images that are small in size and only use a few of them. If your email is taking too long to load, you may lose your audience’s interest. I don’t have time to send out daily or weekly emails! I have enough on my plate as it is. Learning a new marketing technique no matter how simple can be a bit of a time commitment. Small business owners are already taxed for time and mental resources. 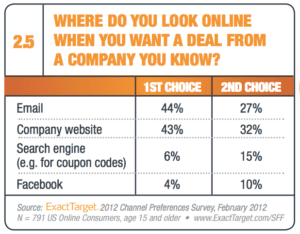 That being said, of all the online advertising platforms, email marketing is the easiest to pick up. If you still don’t have the time, many online marketing companies including White Hat Matt offer email services to help overwhelmed small business owners like yourself start their campaigns. Let’s be clear: we’re not saying that social media marketing has no value. It does, and in our recent article Quickly and Simply Start Your Business on Facebook Ads, we outline what some of those benefits are and how to quickly get started. We’re saying don’t throw out the old to make way for the new so soon. According to global benchmarking research in 2017, email still has a very high rating by marketers. 53.6% of marketers rated it as excellent or good, as opposed to social media and search engine optimization which are rated second and third by marketers (social had a rating of 50.9%, and SEO had a rating of 45%). Also, more than half of the companies surveyed in this research said that they were planning to increase their email marketing budget, whereas only 7.5% were planning to decrease it. Email marketing still has massive potential to increase your sales and help your brand image even in the age of social media. Looking to learn more? 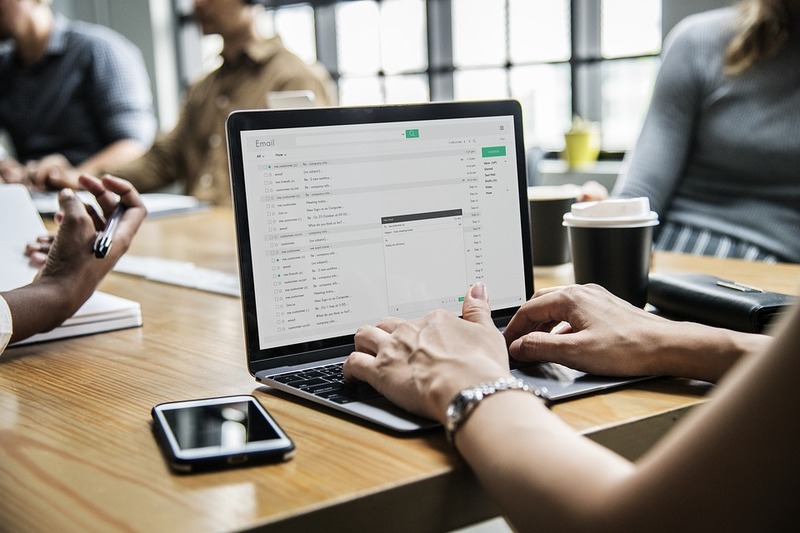 Here are some other resources about email marketing that might be of interest to you, including some of the links to pages we researched for this article. There is also a link to the free HubSpot course that will get you started on email marketing techniques and best practices.